Both Congress and President elect Obama are talking large stimulus packages. Government becomes the "consumer of last resort" and, if done properly, it can buy things we really need. Things like transportation infrastructure and affordable housing. The private market hasn't been bringing enough of what we really need. Construction on Walton Place near downtown Bellingham. A stimulus check as tax rebate might just go into the private market and get lost in buying imports. Do we really need more toys from China? When government becomes the consumer, it can direct spending toward more long term needs that private market doesn't seem to buy. Things like roads and bridges. Research into cleaner energy. I'm sure private markets do some of this, but it seems like government needs to set direction. Let private enterprise do the work, contracting and so forth while government buys. 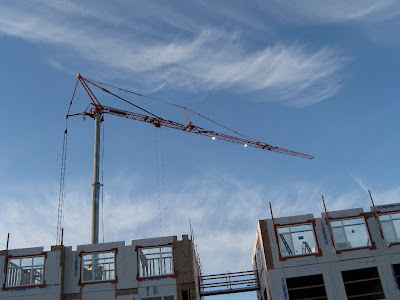 Pictured above is a large crane working on local project of mixed and affordable housing. Crane was brought in this fall as lots of other projects faltered from the current economic crisis. This project is moving forward. Government is involved. HUD money I think. Government can be the consumer of last resort. Also, hopefully, a wise spender. Where does government get it's money? Hopefully it doesn't have to be paid back. The Federal Reserve prints it? I'm sure government does owe lots of money, but somehow, it seems to get by ringing up more debt. Interest rates remain low. There's plenty of capital, but government seems to be the only conduit that's trusted these days. I guess it's called priming the pump.